This was my first time flyboarding. It’s really fun, but has a bit of a learning curve. This video is the result of a 25 minute session cut down to two and a half minutes. The key is to somehow lock your ankles and knees but keep your body relaxed. You can see on my better attempts that my ankles/feet stay in the same position. On my less stable attempts, you can see how unstable my ankle angle is. I hear that the second and third time sessions are dramatically easier than the first attempt. It’ll be fun to do this again. This was at SoFlo Flyboarding. Kids have to be 80 lbs minimum. Can’t wait till the kids are little heavier…Jen! Can we feed Logan more? This was actually my second time doing the trapeze, but the first time was more than two years ago. This was an Aerial Trapeze Academy Groupon. With the Groupon, you only get to do the beginner session, which is three practice swings, where you try to get into the knee hang/transfer position. If you can successfully get into that position, then on the fourth swing, you get to to try for a mid air catch. They also do birthday parties and private groups. Kids can do it as young as 4 years old, and they work with autistic kids. Once you’ve done the beginner session, you can do more advanced stuff. This is really easy and fun if you have any amount of athleticism/body control. Highly recommended. PSA: Hanging from the bar with your knees can give you friction burns. If you have leggings or tights, you should wear them. Facebook just showed me this photo. It was from five years ago. I remember thinking at the time, “Getting a bit tubby there. You really need to lose weight.” Apparently I didn’t take that advice for a long time. Now, as I come to the end of the first phase of my body changing journey, I’d like to reflect back on some lessons that I’ve learned along the way and let you know my plans for the future. Hopefully you can learn something from my experiences that will make your own journey even easier. I started this journey around 212 pounds and am, as of this morning, 167.4 pounds (45 pounds for those of you bad at math). It has taken exactly 7 months and 4 days to get to this point. Most of my progress was made on the a fairly aggressive caloric deficit. I have very strictly monitored my caloric intake and tracked my protein, fat, and carbohydrate intake. I’ve worked out three times a week (45 minute weight workouts) and walked on the off days. I haven’t done any running or high intensity cardio workout except for recreational (riding a bike with the kids) or situational (sprinting to get out of the rain). As for the 45 pounds, I’ve actually lost more than 45 pounds of fat, because I’ve added some muscle along the way. For example, today I did 6 chin ups with 50 pounds attached. When I started I could barely do four bodyweight chin ups. For the purposes of this post, I’ll guesstimate five pounds of muscle for a total of 50 pounds of fat gone. This is the product of our own brains working against us. Our brains are designed to recognize patterns. We are hard wired to learn from our experiences and continue what has worked in the past. This is known as heuristics. Unfortunately, our brains can also recognize patterns even where none exists, and this is especially true when it comes to losing weight. Losing weight is a very long, intentional process. Even though it all comes down to a caloric deficit, there are a large number of variables to account for, and the research is often controversial with multiple credible researchers lining up on opposite sides of a given issue. So when a person successfully loses a lot of weight, they become highly attached to any behavior or action that occurred during the process, even if the action had no or minimal effect on their weight loss. When I first started flexible dieting, the recommendation in the program is walk 45 – 60 minutes on the days you don’t lift weights. It just so happens that 3 laps around my neighborhood takes about 55 minutes, so that’s what I did four times a week for several months. Then, midsummer, I participated in a steps competition at work (team with the most steps after eight weeks wins a Fitbit…most inefficient way in the world to win something if you ask me). Toward the end of the competition, I was doing 5 laps around the neighborhood. Even though it was miserable, took too long, and my feet hurt and got blisters, once the competition had ended I was actually afraid to go back to only 3 laps. “What if my weightloss stalls? What if the only reason I was losing weight was the extra calories of the extra two laps?” You get the idea. What about this bulking thing? Most people who begin this fitness journey by cutting a lot of weight don’t plan to simply get thin. Once they’ve lost weight, the goal is usually then to gain muscle mass. The problem is that after months of working hard to lose weight, they become afraid to eat more. When you’ve deprived yourself for seven, eight, even 24 months to get thin, the last thing in the world you want to do is get fat again. The problem of, course, is that it’s impossible to build a significant amount of muscle while maintaining a deficit. Heck, it’s practically impossible to build muscle while eating maintenance calories. To grow muscle, you really need a surplus. So the one thing that a person needs to do in order to build muscle is the one thing that person is afraid of—even when they know better. I’ve seen it dozens of times on Facebook fitness groups. I’ve even experienced it myself even though my plan was always to bulk after losing the weight, and even though I’ve been far more successful losing weight than I ever thought I could be. After all, my weight trend has been up for the last 15 years. So let’s run some numbers and see just how silly it is to be afraid of bulking. The general recommendation for a lean bulk is about 1900 extra calories per week. There is a current controversy over whether beginners and intermediates should follow that recommendation or do a slightly larger bulk of 3500 calorie weekly surplus (500 extra calories per day). Now if you remember your fat math, one pound of fat is 3500 calories. So if every single calorie of surplus went into fat, I’d gain one pound of fat per week. It would take me 50 weeks (an entire year) to gain all that fat back. Let’s say, just half of the surplus calories get funneled into fat, then in one year, I’d gain 25 pounds of fat. And if just a quarter of the calories go into fat, then I’d only gain 12.5 pounds of fat in a year’s time. Now I’m only planning on bulking through March (7 months), so in that time, assuming 25% of the surplus going into fat, I could expect approximately 7.5 pounds of fat. From my experience with AFL, It should only take about 2 months to lose those 7.5 pounds of extra fat. So don’t fear the bulk. Embrace the bulk. Seven months of eating 3000 calories instead of 1925 calories. You get to eat that way all through Thanksgiving, Halloween, and New Year! You even get to eat that way for Valentine’s Day. If you really want to go to town, save 200 calories each day, and have an extra 1200 calories for an epic 4200 calorie day (a solid Thanksgiving plan). The decision to stop cutting and start bulking is complicated. The general recommendation is cut until you’re about 10% body fat, and then bulk until you’re about 15% bodyfat, and then lean down again. I’m only about 13-14% body fat, and I haven’t quite hit my leanness goals (as defined by waist measurement and having a six pack). So why am I bulking? Three reasons. The longer you cut, the harder it becomes. I’ve been cutting for 7 months now. At first my daily calories were 2000, and I lost almost 2 pounds a week. Now my daily calories are 1815, and I lose less than half a pound a week. As you lose weight, your body doesn’t need as many calories. That makes it progressively harder to keep losing weight. Cutting is stressful—quite literally. Your body thinks you’re going to starve to death and tries to mitigate things by losing excess muscle. So you have to do heavy strength training to convince your body to hold on to muscle and lose fat instead. This causes your body to be stressed. Eventually, your body will adjust hormonally to reduce your metabolic rate. This was the subject of the Biggest Loser Study that I discuss here. Cutting is also stressful mentally. Bulking gives you a mental break and resets your hormones. Most importantly it allows you to gain muscle. At my current weight, I probably would have to lose 7-8 pounds of fat to achieve a 10% bodyfat. I would look ridiculously skinny at 160 pounds, and it would probably take 3-4 more months. By lean bulking I’ll add hopefully 10-15 pounds of muscle in the next seven months with only a small amount of fat. Then when it comes time to lose the fat, I can do so at a higher (more enjoyable) daily calorie intake, and it won’t take as long to lose, so it won’t be as stressful. So that’s the plan. Why do you keep emphasizing lean bulk? A lean bulk is a controlled bulk. In my case, 500 calories over maintenance, or about 3000 calories per day, while maintaining an appropriate macronutrient balance. The traditional way of bulking is just eat a lot, which is of course how I got into this problem in the first place. So don’t just bulk. Lean bulk! A little less than six months ago, my journey into fatness ended, and I started losing weight. 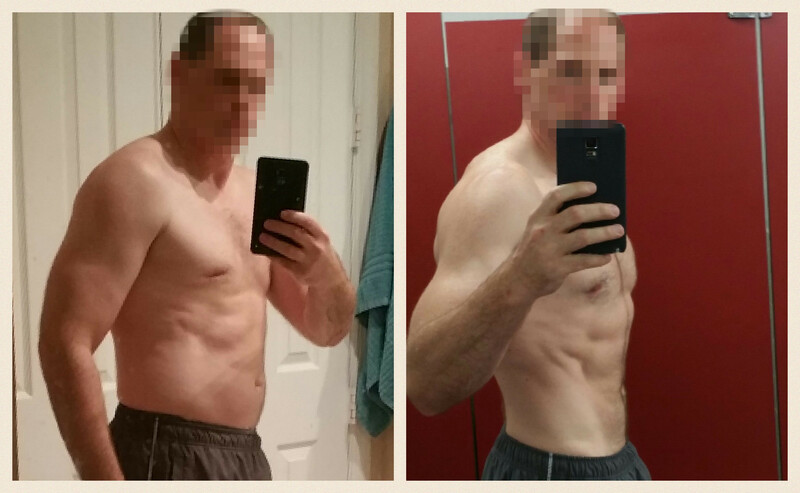 I’ve chronicled the beginning of my fat loss journey here and how I lost the weight here. For all but the first three weeks I used the flexible dieting approach coupled with a weight training program. Today it’s time to show my progress. 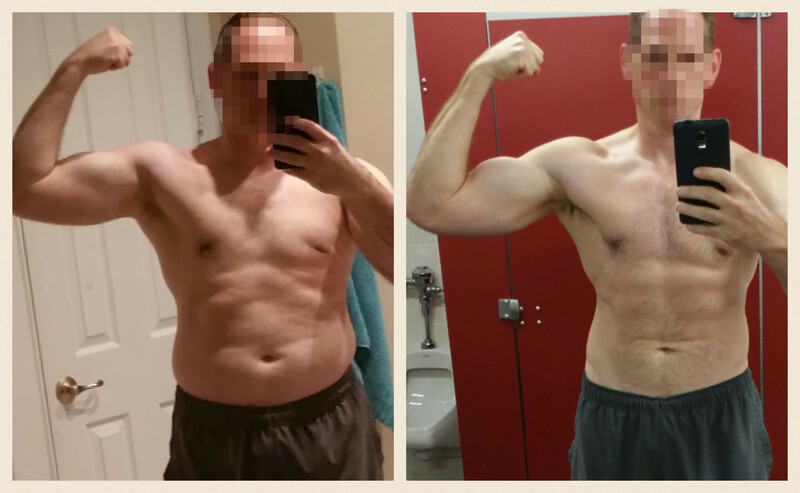 Update: To see how I ended up at the end of the program, see A Fat Loss Year in Review. For your protection, the photos are blurred. If you really want to see them, you’ll have to click on them. I must warn you that the photos below show middle aged man torso and abdomen. Now it’s quite possible that those photos aren’t me at all, and are just some guy I found on a Facebook Fitness Group. But before we get to the photos, let’s have some stats. Okay, and without further ado, here are the photos. 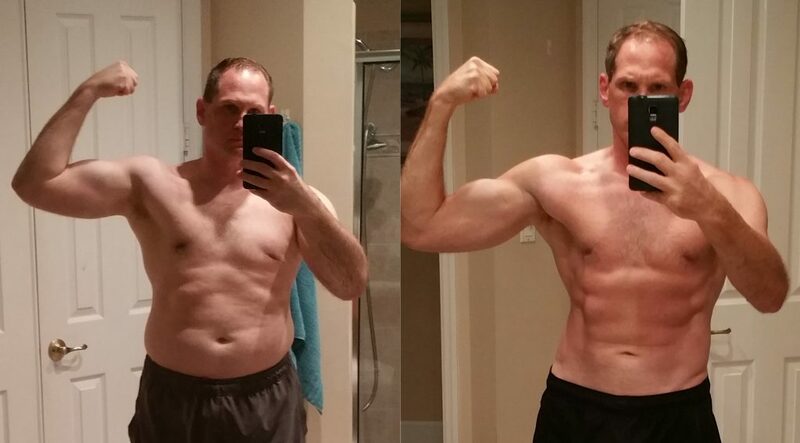 The “before” photos are at 197 pounds after losing 15 pounds, so they’re not as dramatic as they might be otherwise. Click on the image to view it unblurred. You have been WARNED!!! Okay, so there you have it. Half naked, middle aged man flesh. I’m currently lighter than I’ve been since 1997, and my waist hasn’t been 33 inches since before then. So you you might be asking, “what’s next?” The answer is, I’m going to try and lose another 5 pounds or so until I have a bona fide 6 pack. Then I’ll transition to a lean bulk program to gain 10-15 pounds of muscle over the next two years. 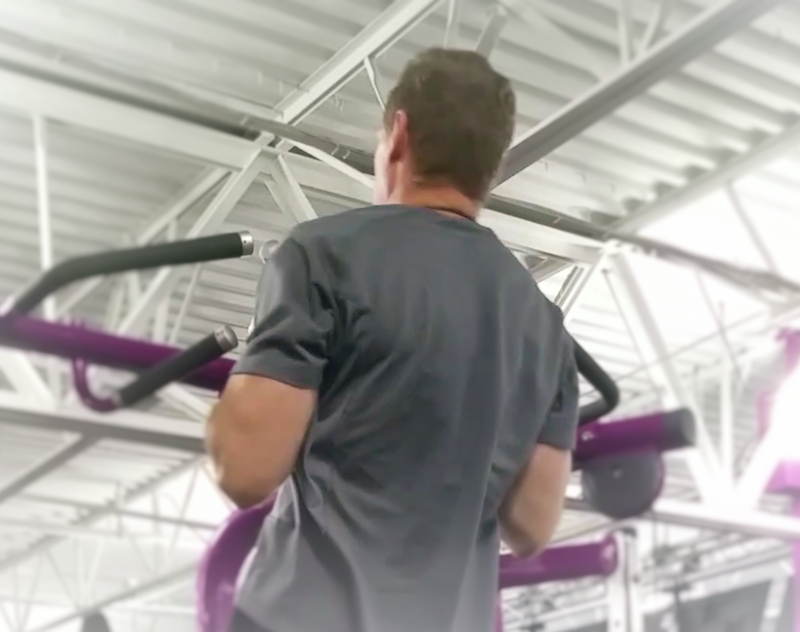 I do plan on writing more about the workout in the future, but for today, I just wanted to give you some tips on how to do more chin ups (or pull ups if you desire). 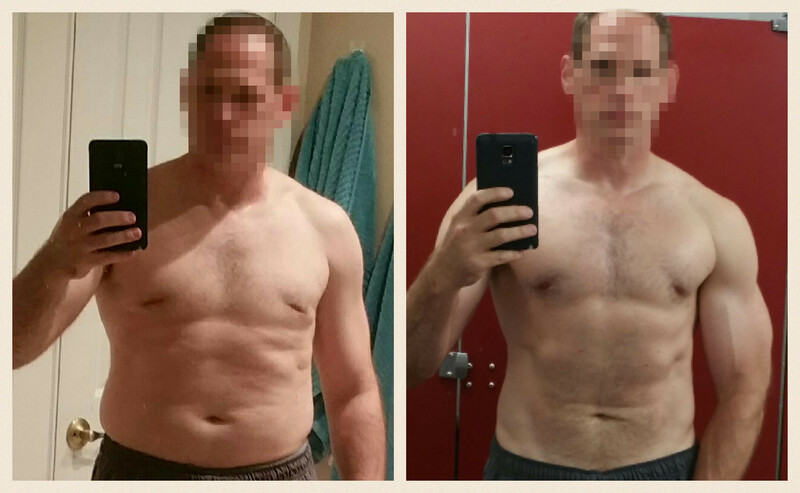 When I started this journey 14 weeks ago, I could barely do 4 chin ups or 3 pull ups. This Monday I did 5 chin ups with 40 lbs attached followed by a set of 6 chin ups with 25 pounds attached. Today (Thursday, I did a set of 13 bodyweight chin ups). Now I know for some people that may not sound very impressive, but I haven’t been able to do more than 8 pull ups or chin ups since I was 19. And I certainly wasn’t as explosive as I am today. So here’s how I did it. You can use this method with either pull ups (palms away) or chin ups (palms toward you). Personally I prefer neutral grip chin ups (palms facing each other). For the rest of this article, I’ll just call them pull ups out of habit. Some people will tell newbies that they need to be able to do 8 pull ups or 12 pull ups or even 20 pull ups before they start adding weight. But I prefer to start adding weight as soon as you can do 4-6 pull ups. I’ve never been good at doing lots of pull ups, and if I had waited until I could do 12 pull ups before adding weight, I’d probably still be doing 5 pounds. Below is how I did it, and you can too…if you like. If you can’t do at least four pull ups, then that’s your first step. If you can’t do any pull ups, then follow this below video for a nice progression. If you can do at least one pull up, then do several sets of as many as you can do with good form at least three days a week. Once you can do a at least 4 good pull ups, it’s time to add some weight. Get a dip belt. Attach 5 pounds and do a set. Wait at least 3 minutes, then do a second set bodyweight pull ups. On your other two workout days just do one set of bodyweight pull ups. So to recap: one set of weighted pull ups and 3 sets of bodyweight pull ups per week. Focus on trying to make your upward movement as explosive as possible. Don’t reach your neck for the bar. Don’t struggle with half reps. When you can’t complete the rep with good form, don’t do it at all. If you really want to do another rep, jump up to the top and do a long negative (slow descent) or get an elastic band and do assisted pull ups. When you can complete six good, explosive pull ups, it’s time to add 5 more pounds. If you can do 5 or more reps with the higher weight, then add 5 pounds again next week. If you can only four reps with the higher weight, stay at that weight until you can get 6 reps and then add another 5 pounds. If you can’t get four reps with the higher weight, drop the weight by 2.5 pounds the next week. Keep doing your bodyweight pull ups for the second set and on your other two days. When you get to the point where you’re doing pull ups with 10% of your bodyweight added, you can start adding weight to your second set. So if you’re 180 pounds, when you get to 20 pounds, add 5 pounds to your 2nd set. Generally speaking you should be able to get at least one more rep out of your 2nd set with lighter weight than your first heavy set. Whenever your second set gets 2 good reps higher than your first set, add five more pounds to it. Follow the same rules as step 3 (but with a higher rep count). Step 5: Take videos of yourself doing weighted pull ups. Man! I could NEVER do weighted pull ups! It’s not really a questions, but that is exactly what I thought until I started doing it. I’ve never been good at pull ups. When I was in the Air Force Academy, the max I ever did was 13, and I assure you the last five were not nearly as explosive as the last five in my video at the top. When you see someone doing pull ups with 70 pounds attached, you think, “there’s no way I can do that,” and you’re right. You can’t do it…now. But if you start with adding 5 pounds, increase your reps to 6, add five more pounds, rinse and repeat, you’ll be doing 45 pounds before you know it. So what’s this simple secret you mentioned in the title? Too subtle, eh? The secret is adding 5 pounds. As you get stronger, you’ll be able to do more pull ups with just bodyweight. Does this work for weighted dips too? Absolutely. It actually works even better for weighted dips. In the time it took me to go from 0 to 45 pounds for pull ups, I went from 10 pounds to 77.5 pounds for 6 reps for dips. The only thing holding you back is not using a dip belt. Some gyms even have one you can borrow. But if not, buy one on amazon. Keeping weight off is IMPOSSIBLE…or is it? Recently a New York Times article about the Biggest Loser TV show made a big splash on some of my friends’ Facebook pages. The article is essentially a human interest story about contestants of the TV show. In case you’ve never seen the show, it’s a “reality” TV show in which extraordinarily overweight people go to extraordinary lengths to lose weight on national TV. The show was a massive success for a while, and an inspiration for many people. Some of the contestants lost upwards of 200 pounds, but there is a problem. Of the 16 contestants from Season 6 (the sibkect of the New York Times article), only one has been able to successfully keep the weight off. Everyone else’s weight has drifted upwards, some as high as they started out. Peppered throughout the article are quotes and tidbits from researchers who used the contestants to conduct studies in weightloss and metabolism as well as other researchers of metabolism and weightloss. Your body wants to be fat, okay? Unfortunately, the former contestants’ metabolisms had slowed significantly, with one of them burning 800 fewer calories per day than would be expected for someone of his weight. On top of that, a certain hormone associated with satiety and weightloss was much lower than normal. This has led some people to the erroneous conclusion that losing weight shouldn’t even be attempted because their body will sabotage their efforts because it wants to be fat. Thankfully, this conclusion is completely unfounded, and I’ll show you why. Now for this particular post, I will NOT be reading any of the research articles referenced. I will only be critiquing the actual text of the New York Times article. Disclaimer: I do not mean to deny or denigrate the experience of the former Biggest Loser contestants (BLC)—but I do mean to show how their fate does not have to be your fate. The most important aspect of healthcare research when it comes to applying the findings to other people is called generalizability–how well a study’s findings can be applied to other people. The most influential component of a research study”s generalizability is how “representative” or similar the sample is to us, the general public…or you specifically. So for example, if researchers find that statin medications can reduce the rate of heart attacks in very high risk patients (for example, men who have already had a heart attack), they cannot generalize those findings to say that statins will reduce the rate of heart attacks in young healthy people with high cholesterol. They must first do the study again with the new younger population before they can scientifically (let alone ethically) say that statins will reduce heart attacks in that population. Mr. Cahill exercised seven hours a day, burning 8,000 to 9,000 calories according to a calorie tracker the show gave him. 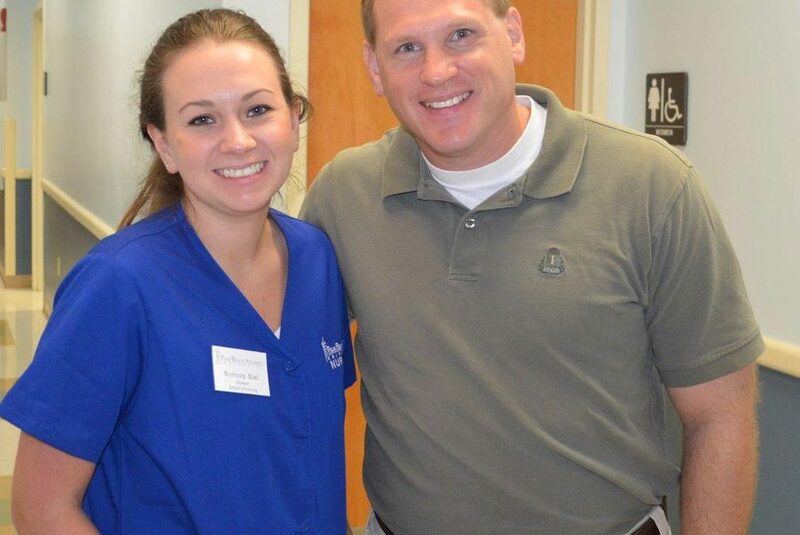 Mr. Cahill set a goal of a 3,500-caloric deficit per day. The idea was to lose a pound a day. If he had not burned enough calories to hit his goal, he went back to the gym after dinner to work out some more. At times, he found himself running around his neighborhood in the dark until his calorie-burn indicator reset to zero at midnight. Mr. Cahill knew he could not maintain his finale weight of 191 pounds. He was so mentally and physically exhausted he barely moved for two weeks after his publicity tour ended. How representative is this experience for the average person? Does it represent you? I can tell you it’s not representative for me. My maintenance calories for my current weight is 2800. I need to eat 2800 (more or less) calories to stay at my weight. Danny Cahill’s calorie deficit was bigger than my entire diet. I would have to eat negative calories to have a deficit that big. My current exercise regimen is a 30-45 minute weightlifting workout 3 times a week plus an hour walk the other four days a week. So in an average week, I’m spending less than 7 hours consciously exercising—less than Danny Cahill did in a single day. I’ve lost 26 pounds recently on the exercise regimen I described above and eating a thousand calorie deficit (1800 calories per day). Once a week, I would do a “refeed” day where I ate closer to 2800 calories. I eat chocolate every day. I drink milk most days (raw, grass fed, full fat milk). I have bread, pasta, steak, birthday cake. I have ice cream on occasion. I even had half of a Miller’s Alehouse “Captain Jack’s buried treasure” (an ice cream/Oreo/Heath bar pie served over hot fudge). I just had to plan my calorie intake for the day accordingly. Compare that to the draconian diets of the BLC described in the article. I, in no way, feel deprived. Nor have do I have binge cravings (which I have had in the past under different weight loss plans). I could live like this the rest of my life if I had to. When I reach my goal weight of 175 pounds, if I wanted to maintain that weight, I’d need to eat more or less 2600 calories per day. The point is that my weightloss plan is 1) enjoyable, 2) sustainable, 3) when I reach my goal, I get to keep doing what I’m doing but have more ICE CREAM!!!! But Danny Cahill’s metabolism is 800 calories less than normal!!! Okay, fair enough. If my metabolism were that much slower, I’m sure it would be vastly harder to maintain my weight loss. However, I don’t think that will be the case for a number of reasons. The first is that generalizable word again. My 1-2 pounds a week weight loss with minimal effort is not comparable in any way to Danny Cahill’s except in the direction of weight. He lost more than half his bodyweight. I’m planning on losing less than 18% of my max bodyweight. Moreover, once I’m done losing the weight, I’m planning on bulking (purposefully eating more calories than maintenance to build muscle). I’m fairly certain that my increased muscle mass will help boost my metabolism preventing me from sharing Danny’s fate. The second reason I don’t think that I will share the same fate that I am eating a fairly high amount of carbohydrates, 35-45% of my diet is carbohydrates, which helps to boost leptin levels. Leptin is a hormone (secreted by your fat cells of all things) that helps promote satiety and weight loss. The contestants of BLC all had much lower levels of leptin even years after the contest was over. But even if my leptin is low, and my metabolism is permanently damaged, I still don’t think it will be to the same magnitude as the BLC contestants. The contestants with the highest weightloss had the lowest metabolisms and leptin levels, so the effect is proportional. 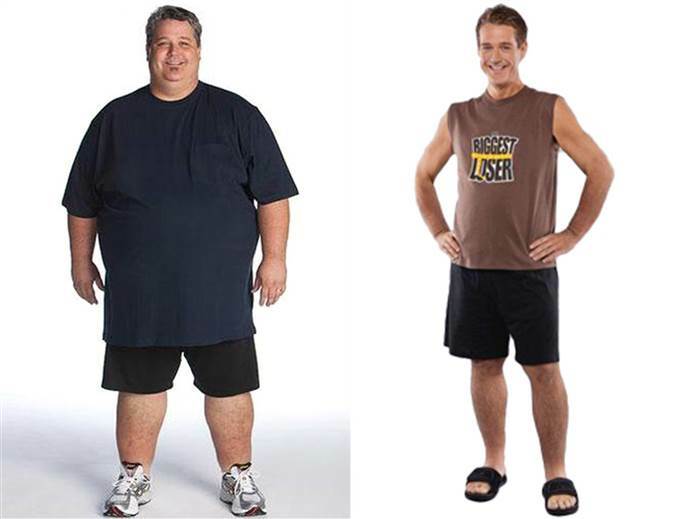 As a ratio of fat lost, Danny lost 239 pounds, with 3500 calories to a pound. So his ratio is 800:836500 calories or around 1:1000. My total fat lost will be 37×3500 = 129,500. So proportionately, I might expect to burn 140 calories less per day. I’m pretty sure I can handle that. Maybe the ratio is based on initial weight, and not weight loss. In that case, he weighted 430 pounds, so 430:800 or 1:1.86. So for me, starting out at 212 pounds, I could expect 394 calories fewer in a day. That’s significantly higher, but still doable. After all, I’m eating 1800 calories a day and losing weight, so if I had to do maintenance minus 400 calories, that would still be 2200 calories a day (400 more than I’m currently eating). Now, there’s a very good chance that I’m not representative of you, but chances are much higher that your more similar to me than you are to Danny Cahill or any of the other BLC participants. But he’s got a PhD from Harvard!!!!! You just have a PhD from University of Florida. He cautioned that the study was limited by its small size and the lack of a control group of obese people who did not lose weight. But, he added, the findings made sense. Every scientist thinks what they are working on is extremely important, and more than anything else, they want to keep getting paid to do it. I’m not impugning any of the scientists and physicians in the article, but scientists and physicians have been known to be a little, well, unduly enthusiastic about the implications of their research—statins in the water anyone? The article also glosses over some flaws in the research such as only measuring leptin and not “other hormones”. It doesn’t mention what these other hormones are. That’s probably the fault of the author, not the scientists. Well if you’re so smart, why don’t you explain it? It seems that most people (in the U.S. anyway) have a tendency to gain weight. For most of us, it’s a pound or two a year. As the article points out, a pound of fat is 3500 calories. There are conveniently 365 days in a year, so 10 extra calories a day will give you about a pound of fat in a year. 20 calories a day will give you 2 pounds of fat in a year. Let that go unchecked for 10 years and you’re 10-20 pounds overweight. Pretty cool huh? The key then is not to let your weight get out of control. If you can stop it after 5-6 pounds, you can lose that weight quite easily and quickly, and then regain it again over the next three years. We really don’t know what the long term metabolic rate effects of this strategy would be. But we can assume based even on the findings of the BLC study that the less weight you have to lose the less impact it will have on your metabolism. 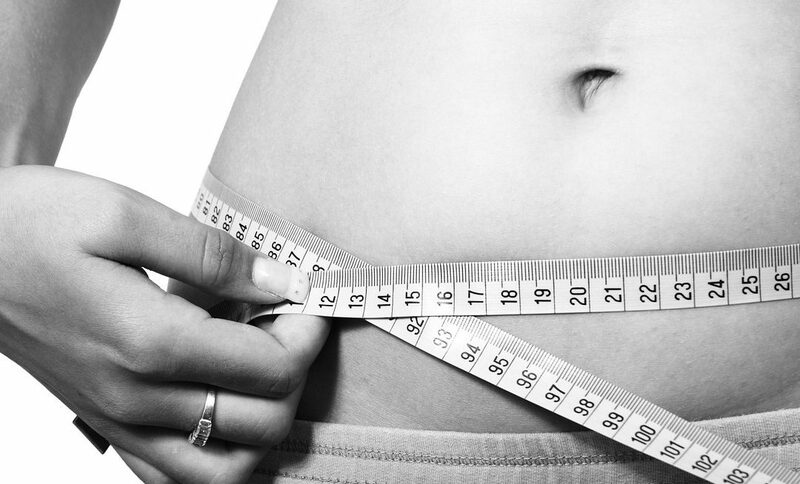 We also know that certain hormones are associated with weight loss while others are associated with weight gain. For example, leptin is associated with weight loss or weight maintenance, while insulin is associated with weight gain. Interestingly, insulin helps build muscle as well as fat, but it’s much easier to build fat than muscle. This is why body builders typically do bulk/cut cycles. During the bulk, they gain both fat and muscle. Then during the cut, they try to lose the fat while trying to preserve the muscle. As the article pointed out, there is a lot that we don’t know. For example, the field of epigenetics which is the mechanisms of how genes are turned on or off is showing that we may all have fat genes, but some of us have them turned on while others have them turned off. And it’s not necessarily only on/off, but there are degrees of on. And most importantly epigenetics shows that our fat genes can be regulated by environmental events such as overeating or near starvation. A very interesting finding is that Adenovirus 36 (AD-36) can cause mice that were previously normal to become obese. If we can determine which genes were turned on or off we may be able to reverse engineer the process and cure obesity in humans. Of course there is a chance that we could unleash a Thinner-style curse on the world. The future has not been written; there is no fate but what we make. Don’t let a study that says your body doesn’t want to lose weight stop you from taking control of your health and life. Since I’ve lost weight, I feel tremendously better, snore less, have more energy, am tremendously stronger, and everyone says how much better I look. And the best part is that it is almost effortless and definitely enjoyable. Okay. It’s not exactly effortless, but compared to doing P90x, it’s effortless. The workouts are strength building (not size building) workouts. That means sets of 4-6 reps with 2-3 minutes of rest in between sets. So most of my time at the gym is spent waiting around. The only “cardio” I do is an hour long walk while I listen to podcasts. The diet does take discipline, but it’s mostly about planning not will power. Because I get to eat foods I like every day, I never feel deprived. I just had to get used to measuring my portions before I eat. 12 years ago, I decided that I should try and look like Brad Pitt in Troy before I turned 40. (He was 40 at the time of filiming.) I’m about to turn 42 and for the first time think I actually have a shot at reaching that goal thanks to flexible dieting and strength training. I highly recommend that you start today. There are tons of free programs out there. Heck. Keep reading this article to get you started. So where exactly did you get those calorie numbers earlier? There’s lots of complicated ways to figure out your maintenance calories, but an easy rule of thumb is multiply your bodyweight by 15. So at 186 pounds, my maintenance bodyweight is 186×15 = 2790 calories or 2800 rounded up. If you want to aggressively lose weight, you want a 25% deficit which turns out to be about bodyweight times 10 or 11. You can read a lot more about the specifics of the diet I’m on in my last post. Rapid Fat Loss (a more extreme approach to weight loss meant to be used for a short amount of time; you can see my review of this book here. As for workouts, I prefer strength training with barbells, and Starting Strength is a great beginner’s program. Starting Strength book with exhaustive discussion of the whys and hows of each exercise in the program. Barbell Medicine is a blog and video podcast by two Starting Strength Coaches who are also physicians. And on that note, I’m signing off. What are you still doing here? Okay, fine. Watch this video you couch potato!